My daily painting adventures and creations. Spring is here! It has been most of 5 winter months, with very little plein air painting. I have ventured out a few times since January to paint. Only to return home with frozen paint fingers and very little actual painting started. Now that spring is definitely here. Everything is blooming in a wide range of colors and compositions. Spring offers lots of opportunities to paint, especially with the wide variety of Texas wild flowers here that deckle our rich historical architecture and homes. It’s truly inspiring but can be overwhelming too. The challenge is selecting a location to paint. To discover a spot that will still be interesting at the end of the painting. So a few weeks back I opted to just look for painting locations. Luckily the local town was founded in 1848 and has a large selection of historic architecture and homes nestled among wild flower and poppy gardens. So there is a lot to choose from. Thankfully, the weather was quite comfortable for walking through the neighborhoods. I happily spent my Saturday morning, just scouting out new opportunities looking for possible compositions. As with all plein air painting there are challenges to consider, like location, safety, shelter from elements, or traffic? Is it safe to park and set up your easel in a new area? Is there sufficient shade shelter to protect you from the sun or unexpected shower? How much street traffic can have a major impact on the ability to start let alone finish a painting on-site. Is there a decent spot to stand without disturbing any unwanted pests like fire ants or wasps? Luckily my scouting about the poppies worked out. As I was recording possible spots, I stumbled upon a lovely side street garden. It was so inspiring! I decided to introduce my self and say thank you for such a wonderful spot. Now I have another place to go and share the fun of painting new garden stories. Since then it has rained a fair amount with more rain. Which means my plein air painting outside will be very limited for me in the next few weeks. So I have been perusing my stash of pictures scored on my outing and working out preliminary sketches. Which means should I get the chance to go paint I will know just where is my next stop! After spending very little of my summer painting I was beginning to feel the frustration of bottled paintings. I was definitely looking forward to some much-needed focused down time just for painting. Last weekend I was able to take a much-needed Retreat on Painting. 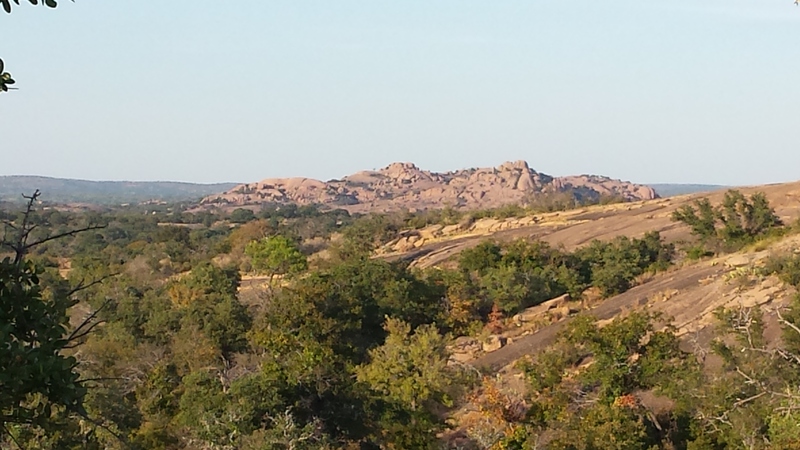 North view from Dutch Mountain, Llano County. 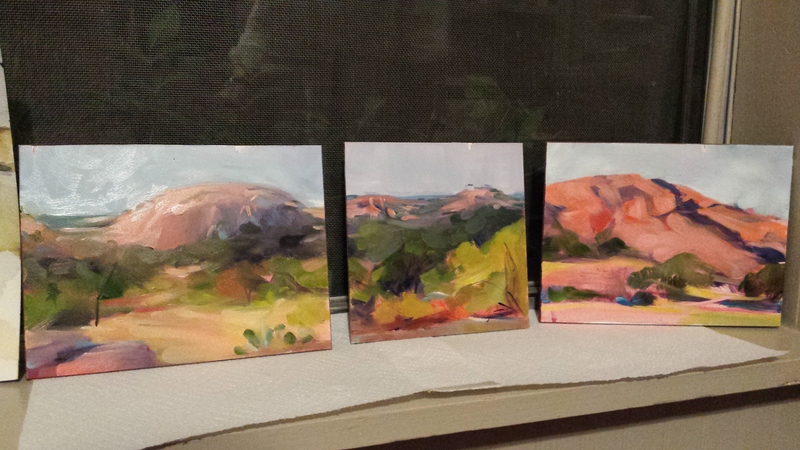 Several of my Plein Air Austin buddies booked the remote ranch on Dutch Mountain in Llano county for a weekend of painting. 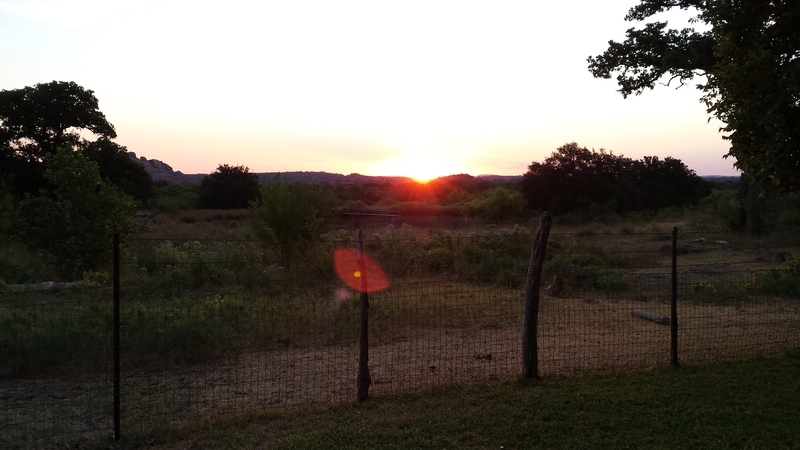 We eagerly ventured out of cellular reception and drove into the remote dirt roads of Llano county. A 3 day weekend of Glamping (camping in a remote area with a glorious hot shower and full kitchen!) 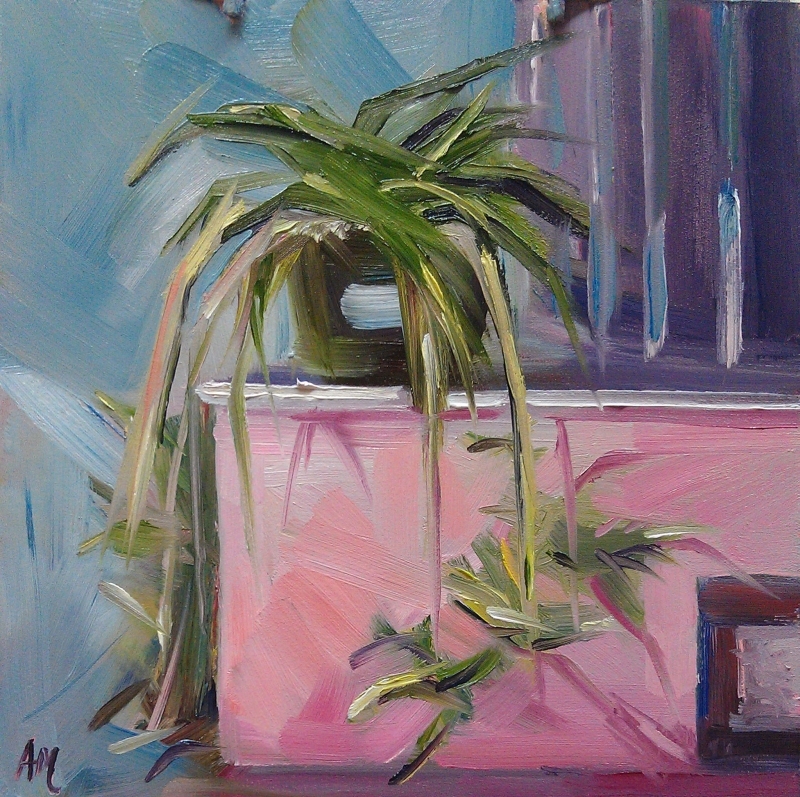 and painting – Plein Air style. No internet, no painting quotas, just take it in, and paint what you find. Look, relax, recharge, Paint, recharge, Paint…It was fantastic. Each morning I found my self awestruck and giggling with the joy of simply watching an unobstructed view of the sun rise across granite basalts and open scrub brush and paint the sky in new tones of pinks and blues every few minutes! Then watching as hushed deer calmly walked across the grounds. And the views were simply amazing! Then we would grab our breakfast and coffee before packing up and driving out into the mesquite brush and harsh granite rock hills. The 5 mph drive trough Sandy Creek and UP to high point was a feat all its own, to which I was amazed I managed it so many times. But it was so totally worth it to park at the top and look across the miles to watch people the size of ants pop up on top of Enchanted rock as we painted the morning lights and shadows. Amongst all the excitement and giggles I did actually manage to paint a few the first day and a fourth on the last day. To which I must say I am rather pleased and even some what enchanted with them as well. I can admit I do a little happy dance inside every time I see these paintings on my shelf. My only regret was not remembering to bring my 35mm camera and zoom lens for better pictures. But I was not disappointed by the 12 megapixel camera my phone had to offer. But I had gone there to paint and paint I did. Now I can’t wait for the next paint out! 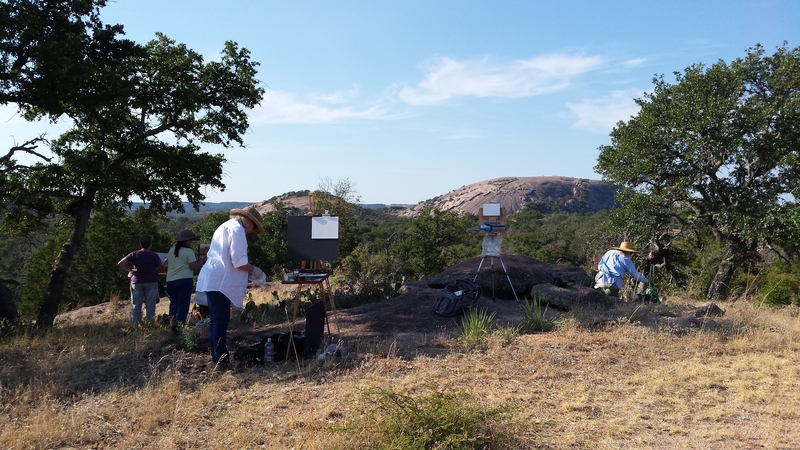 I’m back in the atmosphere…of Plein Air painting that is. It did take a push and a shove but I am getting there. So I am learning to make the most of my time to enjoy what I love most. 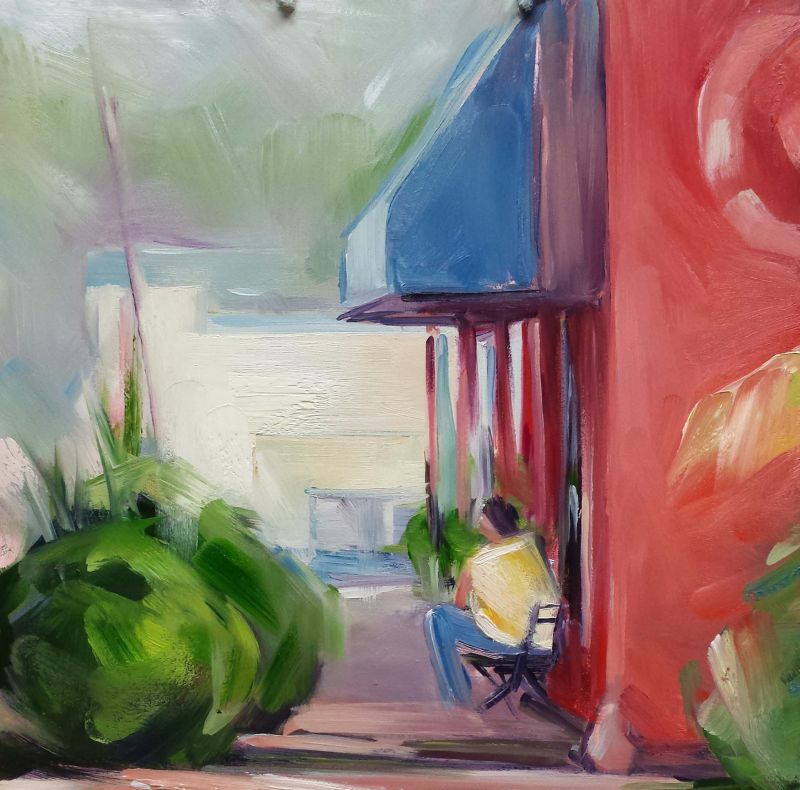 Painting and visiting new places…so en Plein Air it is! Today, we were graced with awesome weather and even a spot of sun now & then. So I ventured out to the stomping grounds of older Austin – Hyde Park. Oh, but what will I paint? There was so much to choose from, I finally just started painting where I was standing. The trick is to find an agreeable spot, off the sidewalk jet not obscuring the painting view. The limited sunlight did prove challenging in mixing accurate colors. But I mustered my brushed and pushed paint. The neighborhood is so active and hospitable! I was so busy painting, I did not have time to take in all the yummy smells from the well-known restaurants. There is so much more to capture. Yes, I shall go back. For now, I hope you enjoy my posts and stay tuned for future painting ventures. Attack of the striped Sock Monster on a cold winter day! Found: 1 lonely sock in our laundry with no mate. It is all alone. Stripe Socks! What better inspiration for painting today? I really did have fun just playing with the patterns and shapes for this one. I am still trying to focus on looser play between shapes and shadows. The colors were a bit challenging to get the warm colors I wanted. 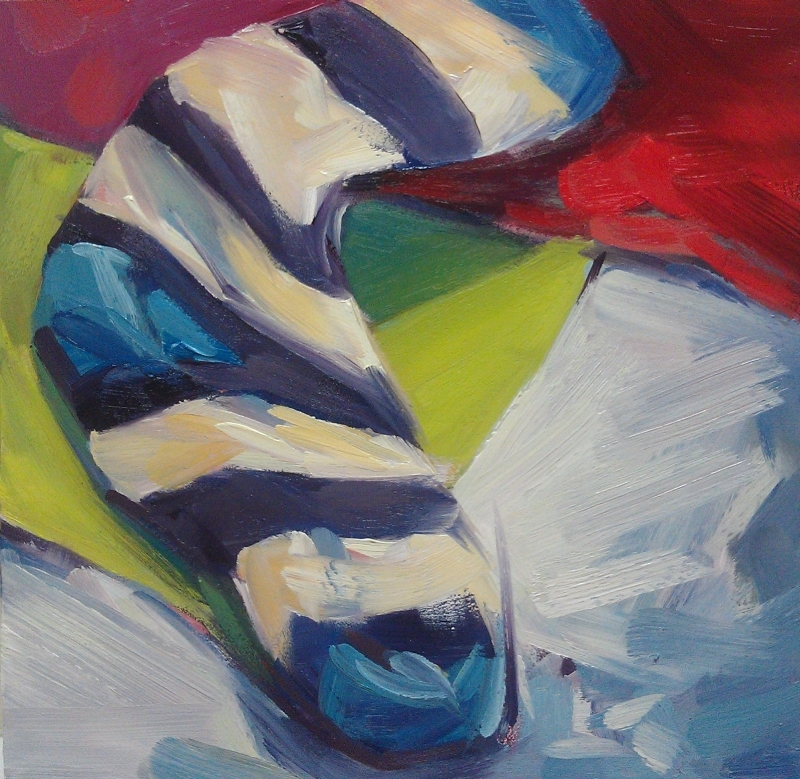 I love the contrast of the stripes playing against the bright and cheery backgrounds. It’s the second day of the new year and my second run at painting in my studio since it was just near 49 degrees outside. It started with the recent challenge project on Dailypaintworks: focus on the Roots! Sure why not. I used the excuse to purchase some of my favorite golden beets. 🙂 They should be fun to paint and even better for dinner later. I set them in the dramatic morning light until I found some rich shadow play. Eye Candy! Then I set about the challenge. The color palette offers rich cad oranges of the beet bottoms contrasted against the cool shadows and green tops. Every bit the visual mixing challenge. I established warm lights and cooler shadows. 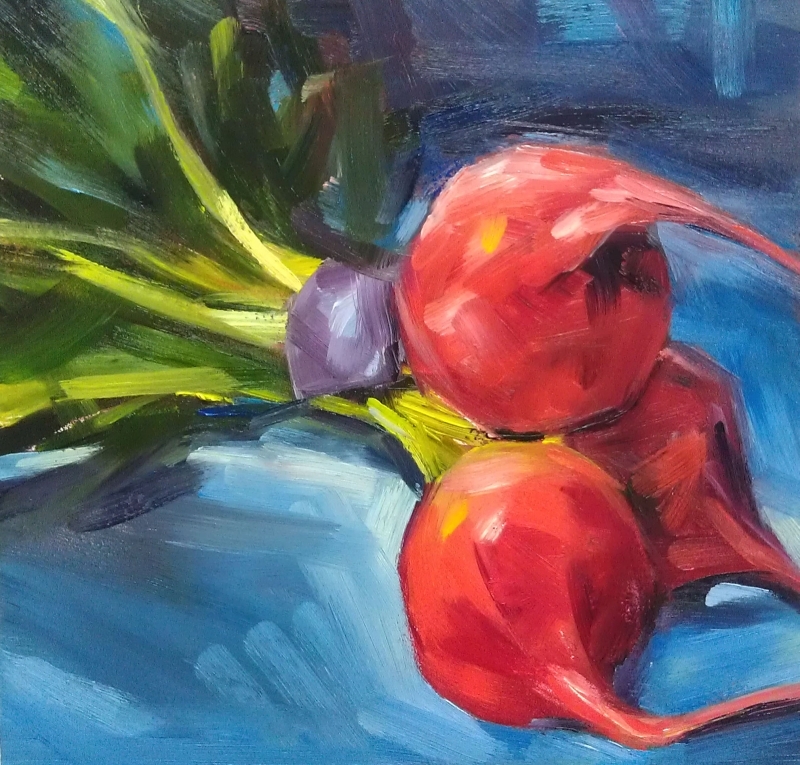 I pushed the values in the lights and the shadows to bring up the forms and establish volume in the beets. So there is the “Golden Root” for today’s painting. Enjoy! My recent adventures yielded a new Airplane plant with lots of happy baby shoots. I have the perfect balcony niche for it to drape over. I noticed it nestled into the evening shadows after sunset. The low light offered a nice opportunity to play with lost shapes and edges as well as colors. So I moved my Easy-L out on to the landing and started painting. I enjoyed pushing paint and working out color shifts. I love defining the shapes of wisps and floating tendrils with playful brushwork. It was a fun stretch for daily painting. One of the local joys of living in Austin area is Barton Creek. It reaches across a wide area of Austin, through changing terrain, dried up creek beds, and hidden water holes that offer a cooling summer spot. Until bountiful rains recharge the creeks and the waters gurgle past crashing rocks and overgrown tree lines. Beauty is found in the changing rock cliffs before and after each rain season. The contrast of soft mossy greens and local sun bleached sandstone crevices and pooling water are inspiring. They can be quite a joy to capture the glow and depth of the rock cliffs. This is another inspired little gem. 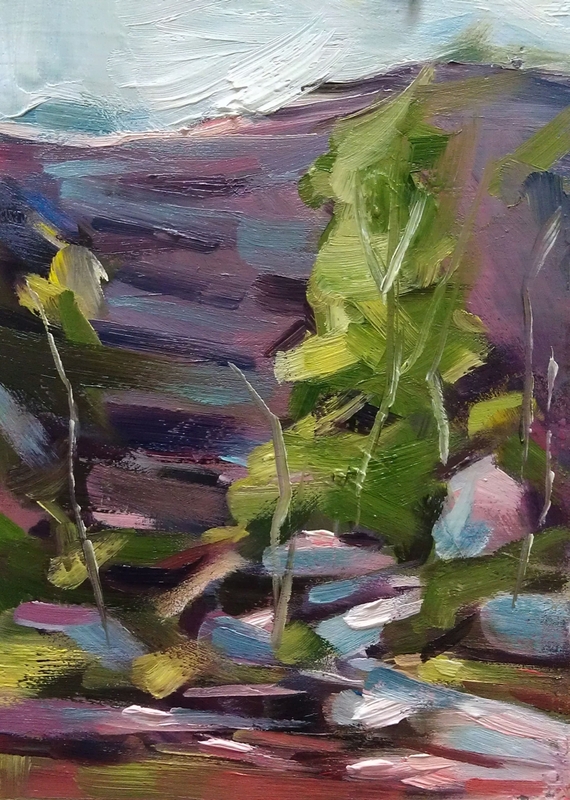 Daily challenges behind planning and finishing plein-air and studio paintings. Art is available for purchase. Please subscribe to be notified of new posts. If you are interested in viewing other work, please visit my website and contact me directly. All images (digital & real) are the sole copyright property of Alexis McCarthy, unless otherwise referenced. Images may not be used or reproduced without written permission.